The possibilities are endless when making lists in Dairy Comp. A solution that may help when creating a list on the command line would be to use the F1 function key. F1 will display a pop-up of all the items in your Dairy Comp program. This is useful when you cannot remember an item code or if you want to see what other items you could add to your list. For this tip to work the command line cannot be blank. What about your heifers? Heifers can often be the most fertile animals in the herd; therefore, it is important to get them bred. If there is an issue or a trend in your heifer breeding program it would be beneficial to see and make any needed changes. To create a BREDSUM graph the just reflects your bred heifers simply type into the command line BREDSUM\RY and a graph will appear. Last week’s tip can be added in addition to this one to look into a specific date range. To follow up with last week’s tip on the weekly conception rate graph there are additions to the command to narrow or expand the date range of the graph. There are 2 ways the conception rate graph can be altered to show any range of dates. The first is by typing BREDSUM\RD. The D brings up a calendar where you will select the range of dates. Another option would be to have a graph showing a specific number of days in the past. If you put a number after the D it will display a graph for that many days ago; for example, BREDSUM\RD100 will give a conception rate graph for the last 100 days. Graphs are a great way to interpret information. Bredsum, as discussed in a previous tip, shows multiple aspects of your breeding program. To view your weekly conception rate type “BREDSUM\R” into the command line and a bar graph will appear. Green represents a normal or expected weekly conception rate. If there is are a significant number of cows re-bred 21 days after their previous breeding then conception rate is less than expected and a red bar will appear. Two other colors are possible. If more than 10% of that week’s breedings do not have a known outcome (pregnant or open) a yellow bar will be displayed for the week and a pink bar points out that 10% of the animals bred during that week were bred within a 2 day period. Check out this graph to see if there are any trends with your conception rate throughout the past year. Want an event to standout on your cow pages? You can change the font and background color of specific events on your cow pages to easily find or differentiate events. 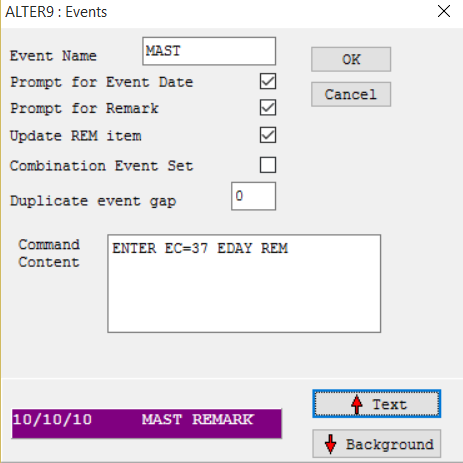 To do this go to Alter, 9 “user defined events”, and select the event you would like. A popup will appear. In the lower right corner there is an arrow up for text and an arrow down for background. Simply click through the color options until you have the combination you want. All DC305, DCCON, and Scout users should have received an email to update their program. To do this, go into your program and click on the Help dropdown menu and select “Check VAS website for updates”. You must be connected to the internet. Next, your program will close, a Java screen will briefly appear, and VAS Web Updater will open. If there is a newer version available you will be able to select update. If there is not a newer version the Status box will read “You have the latest version”. Your version date should be October 7th or later. Both Dairy Comp and Scout have various options to back up your program. Saving to an external flash drive daily is a simple way to prevent a major loss of data and save time getting your program up and running again. In setup select the tab backups and look for SAVE Command. From there select “Use Internal Backup” and type the letter for the flash drives port followed by colon and backslash, for example D:\. Next Time: This should be a time that no one is on the computer, but it is still on and connected to the internet. Once setup it will run every day at your selected time. If you have any questions feel free to contact our software support team at 1-800-827-3442. For software users that have this currently in place, please check to make sure it is set to daily. BREDSUM is a great tool to look into your breeding program. By selecting BREDSUM in your menu options you will get the stats for your entire herd. You can view lactations, pens, and other sorts or filters by typing BREDSUM into the command line followed by a “FOR” OR “BY” statement, for example BREDSUM for LACT=1 will show the stats for lactation 1 animals only. After hitting enter in the command line you will be either brought to your report or prompted for the same BREDSUM options as usual. Once you select a report it will only be for the specific group of animals that you selected. Many people take on the role of Breeding Technician on a dairy. Easily track who is breeding using your software program. First, click File, Alter, then E “Breeding and Technicians” and a pop-up window will appear. Double click “<Available>” and you will be prompted to select a number to represent the technician and then enter their name. Next enter a “Y” when prompted to make active. To delete a technician put a 0 in for their technician number. See the statistics for each person with the BREDSUM report.